Just sorting through some emails and finding the DT cards I haven't posted yet. And fiddling with my new iPod running mix...it's kind of hit and miss right now...by 'kind of' I actually mean 'very.' I should put Earth, Wind & Fire's September on there! If that song doesn't make you feel good, I don't know what would. Hey, sweet! Did you all know iTunes has exercise music? That is AWESOME. Epoxy stickers by MOD (Autumn Leaves. Bling Brad by Making Memories. 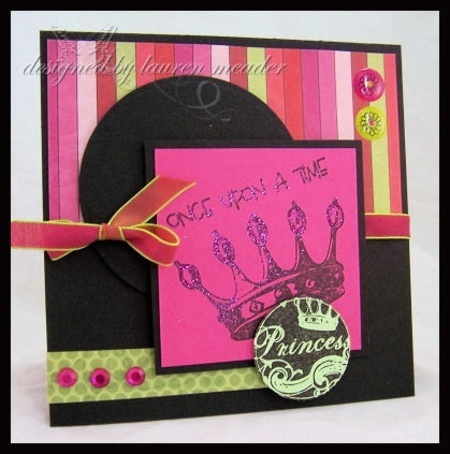 Cardstock by PTI (white) and Stampin' Up! (black). Black ink by Brilliance. Laura tapes these on the sides of bags or the tops of small gifts to give them that little extra sumpin' sumpin'. I would say that's a lot of extra sumpin', these are dang cute. And unbeknownst to Laura, I am working on a bird stamp that actually looks kind of like that cute little guy! But with a different beak. She's a cute one, I think you'll like her. Do I make anything besides thank you cards? The chipboard circle and leaf are both by Stampin' Up!, as is the yellowish ink (More Mustard), Chocolate Chip ink and Earth Elements cardstock. 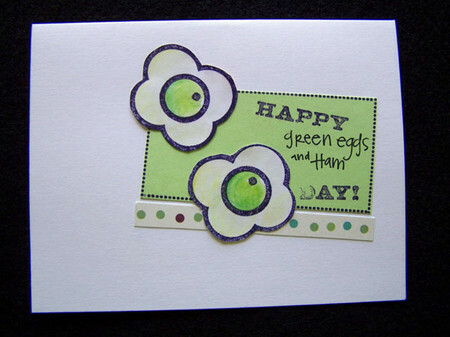 The ribbon is part of Basic Grey's Two Scoops line and the green flower is Bazzill. Grid background is my Dotted Grid stamp and the "thank you" circle (punched with a 1" punch, handily!) is from Thank You. I have such creative names for these stamp sets, huh? Spoiler alert: My next sheet is going to be called The One With Seven Stamps On It. Another "thank you," this time mixing up two sheets -- Labels and Thank You. This sketch is way simple, but you can change it up quite a bit. The base + stamped cut out + background paper + ribbon present lots of interesting possibilities, if you just switch them out. Or...try stamping that label on patterned paper. A little bit of sad, a little bit of happy. Sad: the design team's year is over. I will miss them, each one was such a creative lady and used the stamps in cool new ways. So to Elizabeth, Laura, Lauren, Sherry and Becky -- THANK YOU! I mentioned a little bit of happy -- three new stamp sheets are here! Check them out in the store. I admit to being partial to the label stamps, because I've been wanting to get those designs made into stamps for awhile and they are pretty and girly. But I don't want to make the dots and grid stamps feel bad. They may not have the "zazz" of the labels, but they are quite the handy little "essential" stamps, creating lovely backgrounds for cards and larger shapes. I'll post more examples this week from all three sheets.